Although mining of gold in Oregon was at an all time low in 1965, mining of nickel, uranium, mercury, and a host of nonmetals was flourishing as one of the important industries in the State. Total production of gold in Oregon from 1852 through 1965 was 5,796,680 ounces. This total includes estimates of production before 1900 and data from the U.S. Geological Survey (1904-24) and the U.S. Bureau of Mines (1925-66) for the years 1902-65. Production data for districts are fragmentary, especially where production of several districts was combined in the reports, thus the totals for districts are minimal and largely underrated. Grant County covers much of the southwestern part of the Blue Mountain region of northeastern Oregon where pre-Tertiary gold-bearing rocks are exposed. The geology of the county, as summarized by the Oregon Department of Geology and Mineral Industries (1941, p. 14-15), includes rocks that range in age from Paleozoic to Tertiary. The oldest rocks are greenstone, argillite, and chert containing small lenses of Permian limestone. Several tens of thousands of feet of Upper Triassic and Jurassic rocks, mostly tuffaceous sandstone, shale, and some limestone, are exposed in the southwest part of the county. The Paleozoic rocks were intruded by peridotite, gabbro, and diorite, and all, including the Mesozoic rocks, were intruded by granodiorite. Tertiary rocks cover much of the county. These are the Clarno and John Day Formations (tuff, lava, and agglomerate of Eocene age), the Columbia River Basalt (Miocene age), Mascall Formation (tuffs that overlie the Columbia River Basalt), and Rattlesnake Formation (tuffs and lavas of Pliocene age). Soon after the initial discoveries of placer gold at Griffin Gulch in 1861, discoveries were made at Sumpter and Canyon Creek, and by 1864 nearly all the mining districts of the Blue Mountains area were known. The important gold-producing districts in Grant County were the Canyon Creek, Granite, Greenhorn (partly in Baker County), North Fork, Quartzburg, and Susanville. From 1880 to 1899, Grant County produced $3,022,564 (about 146,000 ounces) in gold. From 1904 through 1957 it produced 77,840 ounces of lode gold, 226,835 ounces of placer gold, and 19,967 ounces undifferentiated as to source. Approximate total gold production through 1959 was 470,600 ounces. CANYON CREEK DISTRICT: The Canyon Creek district, which is between lat 44011' and 44030' N. and long 118045' and 11933' W. and includes most of the drainage area of the John Day River in Grant County, is noted chiefly for its gold placers along the river Estimated early production from these placers was about $15 million in gold (about 725,000 ounces). Hydraulic operations were conducted in the 1880's, and dredges were in operation sporadically after 1900. Recorded gold production for the district from 1904 through 1959 was 899 ounces from lode mines, 91,711 ounces from placers, and 504 ounces from undifferentiated sources. Total production was about 818,000 ounces. GRANITE DISTRICT: The Granite district is between lat 44045' and 44054' N. and long 118018' and 118033' W., in eastern Grant County. As early as 1862 placer gold was mined from the gravels of Granite Creek, Clear Creek, and Bull Run; in 1874 lode mining became commercially important when the Monumental and La Belleview mines, the most productive lode mines in the district, were discovered. Much of the early placer mining was done by the Chinese, who at one time outnumbered the Americans. From World War II through 1959 the district was virtually idle with the exception of the Buffalo mine which supplied nearly all the lode gold mined in eastern Oregon during that period. The total lode production of the Granite district to be $1,800,000, most of which was in gold and in small amounts of silver. This would represent, conservatively, about 75,000 ounces of gold. Recorded lode production for the district from 1904 through 1959 was 37,250 ounces. Placers yielded $1,033,000 in gold through 1914. Recorded placer production from 1904 through 1959 was 34,080 ounces and total gold production for the district was about 160,000 ounces. GREENHORN DISTRICT: The Greenhorn district straddles the Baker-Grant County line. The western part of the district, in Grant County between lat 4433' and 44045' N. and long 118018' and 118043' W., will be discussed here. The mines in the Greenhorn district reached their peak of productivity between 1895 and 1910. From 1910 until 1942 there was only sporadic activity, and from 1942 through 1959, almost none. Only fragmentary records of early production are available. A total of the estimates of early production of individual mines is $346,000 (about 16,800 ounces) in gold. Recorded production from 1932 through 1959 was 4,829 ounces from lode mines, 4,612 ounces from placers, and 425 ounces undifferentiated as to source. NORTH FORK DISTRICT: The North Fork district includes the drainage area of the North Fork of the John Day River and Desolation Creek between lat 44045' and 45000' N. and long 118015' and 118055' W. This is a placer district that dates back to the early 1860's. The total minimum production to 1914 at $893,000 in gold (about 43,000 ounces); since then, only 1,336 ounces have been reported from the district. The principal mines were the French Diggings and the North Fork. At the French Diggings both moraine and stream gravels were mined, and at the North Fork a gold-bearing terminal moraine was mined. QUARZBURG DISTRICT: The Quartzburg district is in eastern Grant County between lat 44028' and 4436' N. and long 118035' and 118047' W. In 1862, placers at Dixie Creek were discovered, and shortly afterward lode mines were producing in the district. 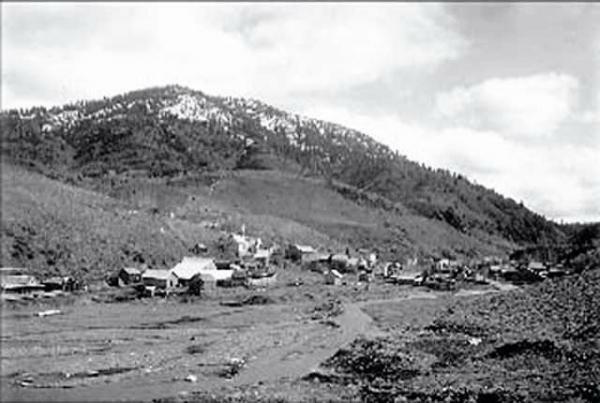 After the initial boom of placer mining, in which estimated production ranged from $600,000 to $6 million, the district slowed down to sporadic small-scale activity stated the production from lode mines to 1900 did not exceed $100,000. From 1904 through 1959, the recorded gold production from the district was 954 ounces from lodes, 8,534 ounces from placers, and 624 ounces undifferentiated as to source. Total production through 1959, using the $600,000 figure for the early placer production, was about 45,100 ounces. SUSANVILLE DISTRICT: The Susanville district is between lat 44041' and 44047' N. and long 11841' and 11852' W.. in eastern Grant County. Most of the production from this district was from placer mining before 1900. The placers were discovered in 1864, and those along Elk Creek and along the north side of the Middle Fork of the John Day River yielded 9600,000 in gold. These placers were inactive in 1930. The Badger mine, discovered in the late 1860's, was the most important lode property in the district, but after several years of successful operation it was closed in 1905, reopened briefly in 1922, and closed again. Most of the recent production from the district was from dredging operations. From 1932 through 1959 the district produced 937 ounces of lode gold and 17,809 ounces of placer gold. Total production through 1959, including the estimated early placer production, was about 48,750 ounces.